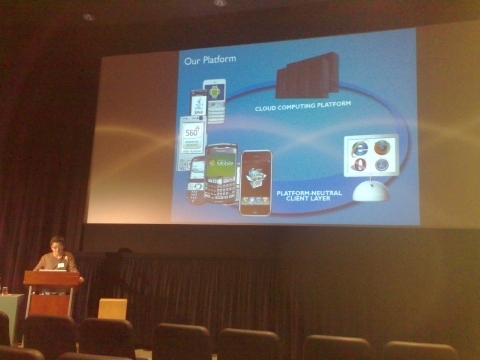 I attended Mobile Web Megatrends today in Berkeley. The one day conference was organized by Ajit Jaokar and included an amazing 18 presentations packed into one day of total mobile web immersion. A highlight of the day was meeting a couple of mobile experts, bloggers and authors I’ve enjoyed reading for years, Barbara Ballard and Michael Mace. There were a lot of great talks and Q&A at the conference. It’s impossible for me to cover them all in even a limited fashion but I wanted to try and capture a bit of the flavor of the conference. For me one theme that stood out was that the mobile web can not be an inferior version of the full PC web. For a long time the limited capabilities of mobile browsers dictated two webs, most full web sites simply would load on most phones and if they did usability was poor. The idea was to provide a mobile equivalent of the full web. The problem was that the mobile web wasn’t very good. Many popular sites didn’t have a mobile versions and those that did they typically contained a limited subset of the content and features found on the same publisher’s full web sites. This was justified by the belief that users, no matter what they said, didn’t really want the full web on their phones. The PC web would always be too hard to use on mobiles. Much of full web content was irrelevant to what were believed to be the dominant use cases of mobile browsing. Users supposedly didn’t want to surf the web on phones, they wanted to quickly find a few bits of information relevant to their immediate interests like weather, traffic and maybe a sports score or stock price. Now we have full web browsers including Opera Mini, iPhone Safari, Skyfire and S60WebKit. Users of these browsers can visit almost any site including mobile web sites. They should prefer the mobile web’s streamlined navigation and context aware content. Wrong! According to Opera‘s Tatsuki Tomita, only about 30% of the sites Opera Mini users visit are designed for mobile. Skyfire‘s Raj Singh echoed that saying the most popular sites with their users were the full web versions of YouTube and MySpace. Raj also noted that much of SkyFire’s traffic goes to smaller and more obscure sites with 56% of SkyFire traffic split among 100 thousand different domains. So there is a long tail on mobile too. These kind of statistics say to me that people want to use the web on mobiles much like they do on PCs. Does this mean the mobile web is dead? Should we all forget about developing mobile sites. Definitely not, at least not yet. The market share of full web browsers is growing but it is still low, around 10% worldwide. The real lesson of this data is that users do not want dumbed down , subset-ed mobile sites, they want to see and do all things that they can on the PC on their mobiles. Content (and functionality) is king even, or especially, on mobile. One presenter who understands that mobile content must match PC web content in quality and content is ESPN‘s, Dan Mason. The sports website has a mobile offering that is deep and wide and includes essentially the same content as the full site. And it’s working, ESPN is the most popular mobile sports site in the US with traffic double it’s nearest competitors. Traffic peaks on Mobile ESPN frequently match those of ESPN’ s full site. Of course it’s not just content that makes ESPN Mobile such a success, in fact much of Dan’s presentation was devoted to all the techniques ESPN uses to drive traffic to the site including home screen and carrier portal placement and links in SMS alerts. Carriers see the demand from users for the full web. That’s why they are implementing transcoders. In my experience transcoding, while often OK, doesn’t give the usability of a full-browser like Opera or Webkit, let alone a well designed mobile site. And publishers and web designers hate anyone, including transcoders from mucking with their content. The user demand for the full web on mobiles is creating some real opportunities for web publishers. To meet that demand publishers need to do two things. Test PC sites in popular full web browsers like iPhone Safari, S60WebKi, Opera Mini and Mobile. The full web browser is the future, get in on the ground floor by tweaking your sites today to look and work their best in this growing browser market segment. Build mobile sites that work on all mobile browsers and contain as much of the content and functionality of your full sites as possible. The web on mobile is taking off, driven by the iPhone, cheaper mobile data and expontential rates of growth in web use on mobiles in countries where PC penetration is low, especially India and China. But users won’t bother with limited, token mobile content. The Mobile web must be the real web regardless of how it’s formatted. This entry was posted in Events and tagged Mobile Web, Mobile Web Megatrends, One Web by Dennis Bournique. Bookmark the permalink. I agree with the “30% is a lot” crowd. Couple of issues. As mentioned, lots and lots of sites don’t yet have mobile sites. And since one-web browsers will only load a mobile version of a site with some user effort, I /think/ that means people are purposefully entering mobile-specific urls. That sort of selection error extends further. Looking only at the records of a one-web browser and deciding overall web browsing trends from that should tend to reinforce the one-web point of view. The same can be said for regional preferences, operator and device-class preferences and more. I’m afraid to go mobile. I’m fairly certain I would pretty much check out of life and surf everywhere I go. Not a good idea for people who work online,. It’s hard enough to look away from the screen. I basically agree with you that sites designed for mobile do (or at least should) provide a better experience in a mobile browser than non-mobile sites. The problem I see is that many, probably the majority of mobile sites present a very limited subset of the content available on the same publisher’s full site. As you mention, ESPN and Weather.com have great mobile sites with virtually all of the content on their coresponding PC sites. The 30/70 ratio of mobile/full web browsing reported by Opera would likely be reversed if every current mobile site provided as the full content and functionality of the same publisher’s full site. Stats presented like the “30%” mentioned above can be misinterpreted. Many people are visiting full websites because many companies/organizations do not yet have mobile offerings, not necessarily because people don’t like streamlined sites. But on mobile devices, websites that are designed with the small screen in mind are faster and cleaner. Check out the dotMobi registry’s sites for developers and marketers – dev.mobi and mobithinking.com. Try ESPN.com on your desktop and ESPN.mobi on your mobile device — or — try weather.com vs weather.mobi … good examples on the way to go. Thank you very much for your discussion of this timely and important subject. We are in the process of developing added features of our internet marketing campaign to target mobile devices. Consumers are increasingly relying on their mobile devices in searching and viewing residential homes and condos for sale. This is a very useful feature in the real estate industry and those who ignore it do so at their peril. You have given us some good idea and we than you for that. For a large section in India,mobile is the only computer they have.And here comes the importance and demand for as much functional mobile website as its PC counterpart.Although,web is destined for unification,mobile web should still grow more robust in content.See Discovery and National Geographic mobile sites;they are disappointedly stripped down.Take Winksite,you can do absolutely nothing as productive on mobile as on PC.Content and functionality are really the bone-marrow of mobile web! When you think about it that is actually quite a high number … the vast majority of sites don’t have any specific mobile presence after all. I do agree mobile sites need to offer full content though – people aren’t going to be happy with a page of ringtone downloads if that’s what the “mobile site” is. thanks for the write up ESPN looks interesting.